Drizzle each piece of salmon with 1 tablespoon olive oil and season with salt and pepper to taste. Heat grill pan and grill salmon on both sides for about 2 minutes. Remove skin and set aside. Make Duxelles. Melt butter in a large skillet over medium heat. Add shallot and garlic; cook, stirring, until softened, about 3 minutes. Add mushrooms, cooking until mushrooms have softened and released their liquid, about 4-5 minutes. Cook until liquid has evaporated, about 2 minutes more. Stir in parsley, salt and pepper. Let cool. Mix sour cream, mustard, lemon juice and dill together. Refrigerate until ready to serve. Cut puff pastry into about 5" inch squares, or large enough to cover piece of salmon. Roll out a bit to thin out dough. Lay a piece of salmon on dough. Spoon Duxelles over top of salmon piece, covering the salmon entirely. (Duxelles recipe should be divided between 4 pieces of salmon.) Top with several layers of fresh baby spinach. 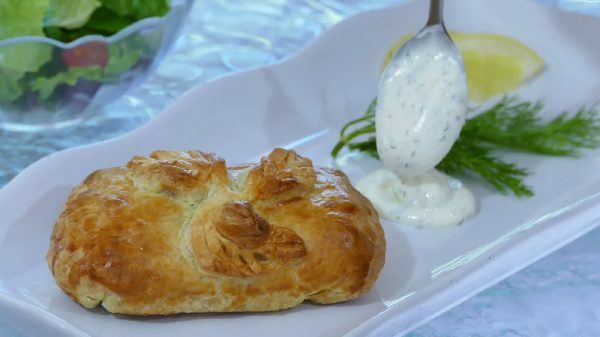 Cover the salmon with puff pastry. Tuck in the sides and turn seam side down on a parchment lined baking sheet. Brush egg wash over the dough. (For added touch, use a strip of dough to make decorative leave cut outs for the top.) Bake at 400 degrees for about 15 minutes or until dough is golden brown. Serve with dollop of Creamy Dill Sauce on the side. Serves 4.